Isn’t it great we are all focused on fitness lately? But hopping from the gym to an aerobic class back to the gym is not effective when it comes to achieving overall health and fitness goals. Also, if you do not know proper techniques to exercise, you would only hurt yourself. It can also become mundane and boring to get up every day and rush to the gym. Don’t you feel you need to be motivated every now and then? How do you follow a structured exercise routine with motivation and make it fun all at once? It is simple; you take on a personal trainer. A personal trainer will help you exercise in a way that won’t hurt you – physically. A professional trainer has extensive knowledge and will help you exercise using proper techniques and methods. This will minimize the risk of injury. When you work at the gym or in a group, the coach cannot offer every individual personal attention. When you train with a personal trainer, he or she is yours for the taking. You have undivided attention for the length of your training session. Whatever your questions, clarifications or observations can be shared. In a way, your trainer becomes your workout buddy. When working with a personal trainer, results are quicker. 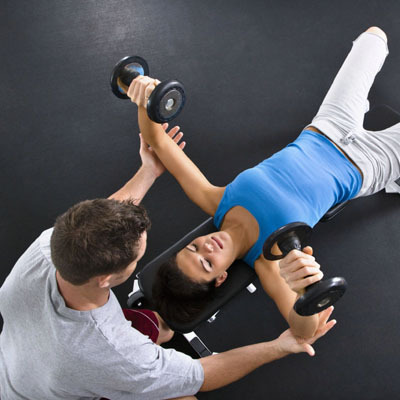 Your trainer will assess your weakness and strengths and what you need to work on. Your trainer will develop a well structured and effective workout program that will yield results in the shortest time. Time will not be lost, unlike when you work out on your own. Each week you will have specific goals to meet and your trainer will be by your side to ensure you meet them. Your trainer will have your best interest at hear, and offer you solid and consistent support. Your trainer cares about your goals and overall health and fitness. Each session you spend with your trainer is time spent focusing completely on you. You will receive feedback, but it will be non-judgmental. Trainers are not there to judge, only support, guide and encourage. Whatever your success, big or small, will be celebrated by your trainer. Your trainer will put together an exercise program suited to your specific requirements. This program will depend on your physical competence, current fitness, past medical history and injury if any. The program will incorporate exercise routines that will help you reach your health and fitness goals. At the start of the program, you must spell out your goals to the trainer, so the trainer is clear about what you aim to achieve at the end of it. The program will be structured according to these goals. Your time with a personal trainer will be not just about training, but also relationship building. It will become a personal relationship where your trainer is not just a coach, but a confidant and friend. It will be time devoted totally to you, and this will help build trust and confidence.